KOKOMO, IN – A close game that is decided on a last-second shot is always exciting. But for the Indiana University Kokomo Cougars, there wasn’t much to cheer about after they dropped their home opener to the Bethel College Pilots, 84-83. The crowd was raucous and Coach Jace Thompson was excited about the turnout, despite the loss. The game was a different story for the Cougars. Like something out of a Dickens novel, it was a tale of two halves for Thompson and his young team. Midway through the first half, IU Kokomo had exploded to a 36-11 lead, mainly on the strength of it’s inside game. Guards Anthony Graves and Johnathon Kelly were lighting things up from the outside, while forward Aaron Knupp was hitting the boards hard on both ends of the court. But then things changed. The Cougars gave the Pilots an opening, according to coach Thompson. Suddenly a game that appeared to be over with IU Kokomo leading 40-14 turned into something else. The Pilots rattled off an 18-3 run to end the first half. A scoreboard that showed a Cougar blowout five minutes before at the half read 43-34 in favor of IU Kokomo. Bethel College was knocking on the door. After some halftime adjustments, Kokomo seemed to be back on track early in the second half. Graves and Jared Lawrence spurred a 9-3 run to push it to 51-37 in favor of the Cougars. However, the Pilots held their ground and started to take control on the inside. Bethel’s Cam Hudgins suddenly became a force in the paint and the Pilots closed the gap to 65-53. Hudgins drilled a pair of free throws at 11:14 to start another run by the visitors. Less than three minutes later, Bethel’s Caleb Hadden’s layup gave the Pilots a 66-65 lead. A 26-point Cougar advantage had completely disappeared. IU Kokomo offered a response of its own and Graves hit a three-pointer at 5:41 to grab the lead back, 69-66. But Bethel, once again, put together a scoring run and score eight straight points to make it 74-72. Lawrence and Kelly hit three-pointers for Kokomo as Hudgins was scoring on the other end. As the clock ran down under two minutes, Kokomo’s Brandon Larrick made two free throws to tie it at 80 with 1:36 left. On the next possession, Graves stole the ball at mid-court and laid the ball to give the Cougars the lead back, 82-80. Bethel’s Hudgins countered at the other end with a layup at 1:02 to tie the game. Larrick made one of two free throws after being fouled to give Kokomo an 83-82 lead with just 44 seconds remaining. The Cougar defense stiffened at the other end and forced Bethel into timeout with 13 seconds left. After the break, Pilot guard Tanner Foust put the ball off the glass for a layup and an 84-83 lead with eight ticks left. Kokomo called timeout and got the ball to Graves, who drove the lane and missed with three seconds left. A Bethel defender and Knupp both came down with the ball and the whistle blew for a jump ball with one second left. The possession arrow was pointing the Pilots’ way. The ball was heaved to mid-court, where Knupp intercepted and gave it one last shot but missed left. Game over and the Pilots win 84-83. Graves led the way for the Cougars with 25 points, including three three-pointers. Kelly finished with 17 points and Lawrence had 16 points. Larrick tallied 11 points for the Cougars. 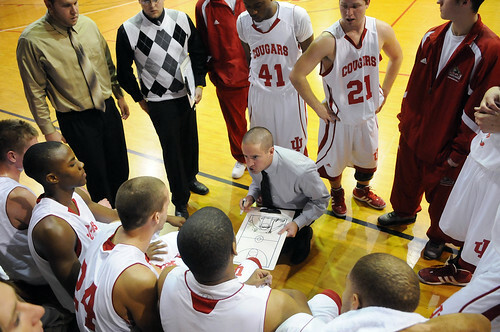 IU Kokomo takes the court again this Saturday in the 2K Sports Classic at Valparaiso University. The Cougars take on Valpo in the first game before facing off against the University of the District of Columbia in the second game.